The Phantom Hydrangea is a new-generation replacement for the old PG Hydrangea – even more beautiful, and with stems that stay upright and never flop over. The huge panicles of pure-white flowers are up to 15 inches long, with hundreds of flowers in them. They sit atop the branches of a shrub that rapidly grow to 6 or 8 feet tall, and a little less across. Not only are the flowers beautiful, they last for months, from early July to the end of September. 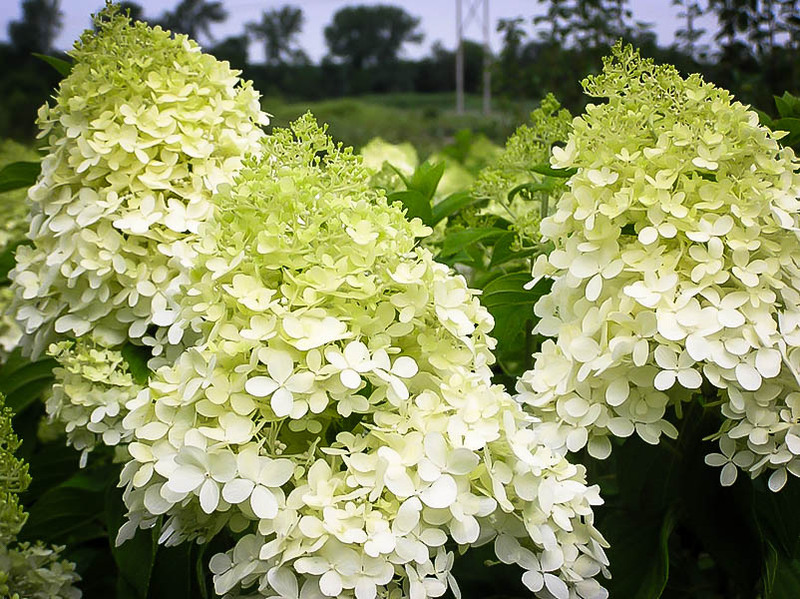 They are a beautiful soft green when immature, pure white when fully developed, and then turn darker and darker pink as the chilly weather arrives in fall. 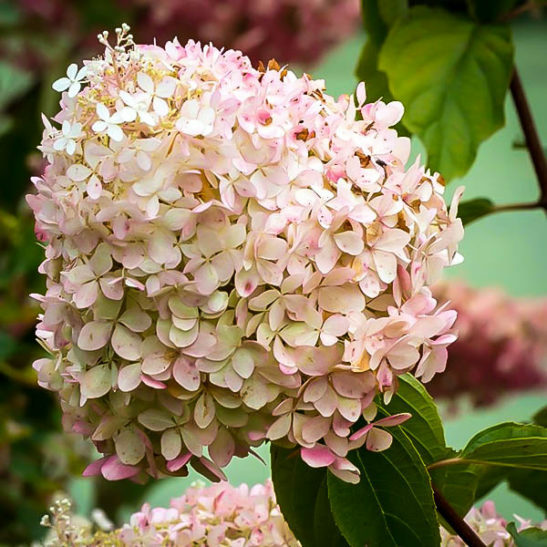 This great shrub is very easy to grow in colder areas where the mophead hydrangeas mostly will not flower, and it is a fantastic addition to any garden, all across the country. Forget the PG and plant the Phantom. 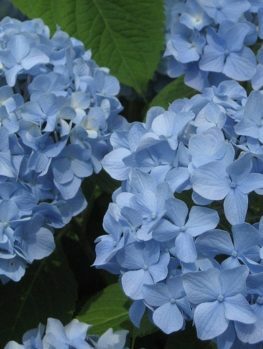 The Phantom Hydrangea will grow well in full sun to partial shade. In hotter regions it does best in partial shade, especially in the afternoons. It grows in all kinds of soils, but thrives in richer, well-drained soil that does not become too dry. Young plant should be watered regularly. It has no particular pests or diseases, tolerates air pollution and urban conditions, and is one of the easiest shrubs to grow. It need some trimming in spring for best results, but otherwise it needs no maintenance to make a spectacular showing in your garden. New varieties of well-known garden plants are not unusual, and almost every year many new plants are released. But something as special as the Phantom Hydrangea comes along very rarely. 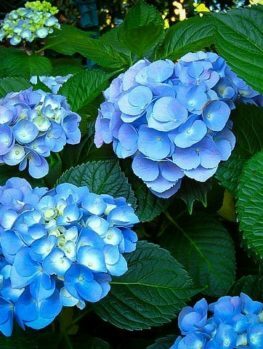 This plant is a modern replacement for the traditional PG Hydrangea – a plant loved by generations of gardeners, especially in colder parts of the country where Mophead Hydrangeas don’t grow well. The PG Hydrangea is well-loved, but it certainly has its faults. The stems flop, and even snap, under the weight of the flowers, seriously detracting from its garden beauty. 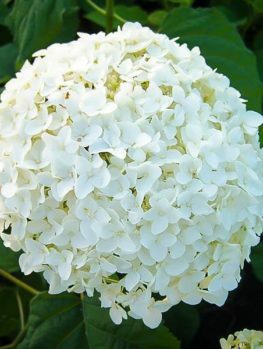 None of this is true of the Phantom Hydrangea, which has amazingly sturdy stems that hold the flowers upright, even though they are often larger than the flowers of the PG Hydrangea. No more disappointment after months of growth or having to face the laborious task of staking every single stem. This is no sales hype – not only did the prestigious Royal Horticultural Society in the UK give the Phantom Hydrangea its prestigious Award of Garden Merit in 2008, it actually voted in 2012 to take away the award given to the PG Hydrangea – so great was the improvement that they basically said there was no point in gardeners even planting the PG Hydrangea anymore. 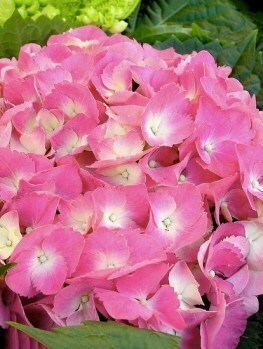 That’s right –that old variety has been completely superseded by the improvements seen in the Phantom Hydrangea. 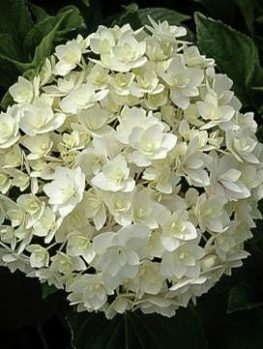 The Phantom Hydrangea is a stunning deciduous shrub, growing 6 to 8 feet tall, with spectacular 15-inch-long conical flower heads of pure white. These begin in mid-summer, and gradually turn pink in early fall, making a wonderful display for 3 to 4 months of the year. This easily grown shrub is hardy to minus 30 degrees, and is a wonderful addition to any garden, especially if you live in an area too cold for Mophead Hydrangeas. 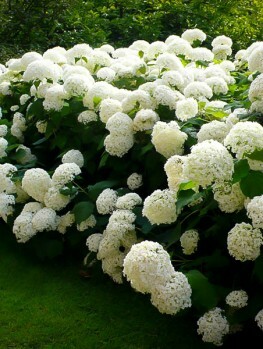 Grow the Phantom Hydrangea among other, earlier-flowering shrubs anywhere in your garden. Plant it as a specimen in a small garden – it will be in bloom longer than any other plant. Plant it in a large pot to bring flowers to your terrace, It can be grown as a bush, or trained up as a small tree, depending on what you need. It grows easily in sun or partial shade, preferring some shade in hotter areas, so it is very useful for those shadier parts of the garden. It thrives in almost any kind of soil, if it is not too dry, or constantly wet. It has no significant pests or diseases. This vigorous plant is very, very easy to grow successfully – a great plant for the beginner gardener, and sure to please. 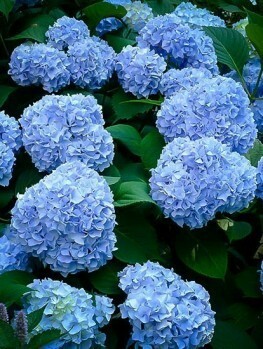 The Phantom Hydrangea is a fast-growing shrub that will soon reach 6 to 8 feet tall and almost as wide, depending on how it is pruned. This deciduous shrub has pale brown stems, with smooth bark on young stems, and rougher bark on older ones. The leaves are oval, about 6 inches long, with conspicuous teeth along the margin. The leaf is soft to the touch, and mid-green in color. In fall they turn bright yellow. They leaves are grouped in pairs or threes along the stems. New stems grow rapidly in spring, and soon you will see a cluster of tiny green flowers developing at the end of each stem. These expand steadily, and around the middle of July these will be large – up to 15 inches long. The flower heads contain hundreds of flowers, and they sit upright on the ends of the stems. 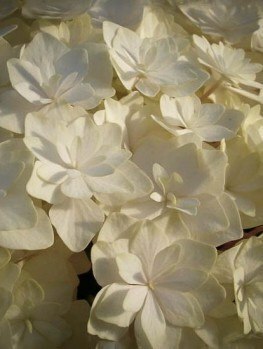 The individual flowers begin life as a delicate shade of green, but soon become pure white, with four or five petals. These enormous conical heads are stunning in the garden, and they last and last. Unlike older forms, the stems remain sturdily upright, holding those heads in the air, not letting them flop and break. As the colder weather arrives in fall, a wonderful change begins. Gradually the white flowers become pale pink, and then darken with each colder day, until by late September they are deep pink. Even after that, as they die, the flowers keep their color, only gradually fading to soft beige. They can be left on the plant all winter, although many gardeners prefer to cut them, hang them upside down to dry, and use them in the house for decoration all winter long. The only care needed for the Phantom Hydrangea is pruning in late winter, just before the new growth begins. It can be pruned three different ways. If you simply remove the old flower stems back to the first green buds, you will have many flowers clusters of a slightly smaller size. If you cut the stems back more, leaving 4 pairs of buds, the flowers will be larger, but not quite so numerous. If you want the biggest heads and the most spectacular show, then cut back to just 2 pairs of buds. The resulting stems will be several feet long, with enormous panicles held proudly upright – a spectacular display in your garden. The Panicle Hydrangea (hydrangea paniculata), is native to south-eastern parts of China, and it also grows in Korea, Japan and eastern Russia. 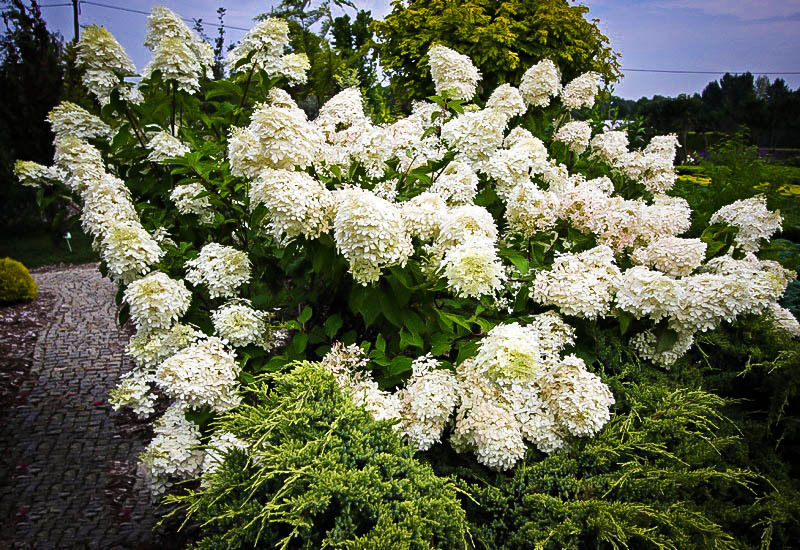 It has been grown in Europe and America as a garden plant for many years, but the traditional forms, like the PG Hydrangea, called ‘Paniculata’ have problems holding up their stems, so plant breeders got to work. The variety called ‘Phantom’ was developed in the Dutch town of Boskoop, a center for plant growing, by Peter Zwijnenburg Jr. in 1990. Phantom Hydrangeas quickly took off as a vast improvement and replacement for ‘Paniculata’, which it replaces. This variety has been grown widely in Europe for several years, but it is only recently arrived in North America. Gardeners are excited to replace their PG bushes, or to grow this wonderful shrub in their gardens. Our stock will not last long, so order now and grow the best, while we can still satisfy your order.